Not a good day - running a fever, unable to breathe until I went to the pharmacy and bought a nasal decongestant spray. The current brand of crud that's doing the rounds is not a nice one. If you haven't yet got yourself a flu shot, it might be worth getting one this year. The new fridge was delivered this morning on schedule, with some nifty maneuvering by the delivery guys getting it through the narrow door without incident. Miss D. and I moved the stuff over from the old fridge tonight, and we'll tackle cleaning it and preparing it for disposal tomorrow. No further posts tonight - I'm for an early bedtime. I'll put more up tomorrow morning. Sleep well, y'all. Norwegian rally driver Petter Solberg and his co-driver Chris Patterson had a narrow escape during the recent Rallye de France 2012. Here are three video clips of the incident, first from the point of view of the spectators; second, from a helicopter; and finally, from inside the car. I hope he bought a few lottery tickets after that, while his luck was still running hot! I wonder what the vineyard owner had to say about his vanquished vines? In the history of aviation there are certain engines that seem to hit a 'sweet spot' in the engineering and aeronautical development life cycle. In Europe the famous French Gnome-Rhone range dominated the First World War, and the Rolls-Royce Merlin powered many of the most famous aircraft (both British and American) of World War II. In the USA, the Liberty L-12 engine of 1917 went on to lasting fame, as did the Pratt & Whitney Wasp series and the Wright Cyclone series during and after World War II. In the era of jet engines, few have lasted as long, or been as successful, as Pratt & Whitney Canada's PT6 turboprop. Aviation Week points out that it first flew in 1961, and will celebrate the 50th anniversary of its certification next year. Tens of thousands have been sold, and the engine continues in full production in a large number of different versions, powering aircraft, helicopters, hovercraft and other vehicles. The PT6 is a stalwart all over the world. I couldn't begin to add up the number of miles I've flown in aircraft using them, from single-engine bush birds such as the Cessna 208 Caravan and Pilatus PC-6 Porter, to larger twin-engined planes such as the Let L-410 Turbolet, the de Havilland Canada DHC-6 Twin Otter and modernized South African Air Force C-47's, to military training aircraft such as the Pilatus PC-7 and the Embraer EMB 314 Super Tucano. In tens, perhaps hundreds of thousands of miles I've covered behind them, most of it over distinctly inhospitable terrain, those PT6's haven't missed a beat - for which I'm devoutly grateful! I have a very soft spot for this engine family. Congratulations to Pratt & Whitney Canada for what remains a best-selling family of engines. With no obvious successor in sight, I'm willing to bet PT6's will still be flying in another half-century from now! Now the Telegraph reports that Britain's tax system is just as bad. France’s tyrannical Sun King knew how to pick his finance ministers. Jean-Baptiste Colbert, Louis XIV’s most infamous right-hand man, once described the art of taxation as “so plucking the goose as to obtain the largest amount of feathers with the least possible amount of hissing”. He would have loved Britain’s shockingly opaque tax system, which sometimes feels as if it has been purposely designed to confuse and fool taxpayers: it is so incomprehensible that millions don’t even realise just how heavily they are being hammered. With 1m families about to be told that their child benefits are being cut, using a sliding scale based on a definition of income that is different from what people actually earn, hundreds of thousands more people are going to have to fill in tax returns. They will be getting a taste of the bureaucratic madness that businesses, the self-employed and many others have suffered from for years. Tolley’s tax guide, the Bible in such matters, reached an insane 11,520 pages at last count, more than double the number of pages in the 1997 edition, thanks to Labour’s obsession with micro-managing the economy; but instead of complexity being reduced under the Coalition, as promised by George Osborne, ever more pages are being added. Compliance costs are still going up, forcing the public to devote ever more unpaid time to unproductive form-filling or to employ expensive accountants. Osborne’s war on Britain’s spaghetti-bowl tax code has failed miserably; not for the first time, the Coalition has been outwitted by the forces of conservatism. The Treasury continues to tinker as if its continued existence depended upon it, and its attempts at reform inevitably end up complicating matters further. Even the most senior accountants admit that no single individual understands the tax system: I was told recently that even assembling a team of 20 crack tax experts in a room would not be enough to pass a definitive judgment on many of its more obscure features. It is not just complexity that is crippling taxpayers: the rules keep changing, which makes planning impossible. The latest Finance Act ran to a hopeless 670 pages, on top of 404 pages in 2011. Because court cases are the only way to work out what legislation actually implies, rules can be torn up on the whim of a judge – and, increasingly, one based in Europe rather than London. What is most depressing is the patchwork of taxes and rates. The same flow of income is routinely not taxed just once or even twice but three or four times as it moves through the system, leaving those who produced it with little more than pocket money. Such cripplingly high tax rates would trigger a revolt if they were widely understood. But because they are so well camouflaged, the Government is able to get away with taxing even people on the minimum wage at extortionate rates. Our tax system is a chain around the economy’s ankles, a crippling burden that is destroying jobs and wealth. It is broken and in need of radical reform. Still cruddy . . .
Light posting tonight, but I'll try to put up more in the morning. Those of you still suffering the after-effects of Hurricane Sandy, take care, y'hear? Having been through several hurricanes in Louisiana, I'm well aware of how nasty things must be in the North-East right now. Hurricanes down south tend to occur during warmer weather, but at this time of year, those affected by Sandy are having to cope with power outages during near-freezing temperatures. Not fun . . . There have been some remarkable photographs coming out of Sandy so far. 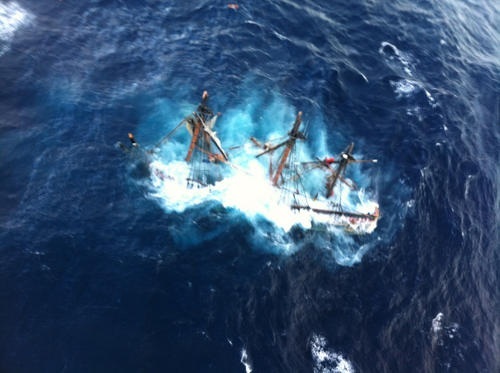 The US Coast Guard put this one on Twitter, showing a replica of HMS Bounty sinking off North Carolina. The Wind Map (which we visited back in April) has this fascinating image showing wind flow and velocity over the continental US as of about 10 a.m. Eastern time this morning. Hurricane Sandy, whose center currently appears to be over the West Virginia/Pennsylvania border region, is dominating the air patterns over a full third of the country's land mass! That's pretty impressive. 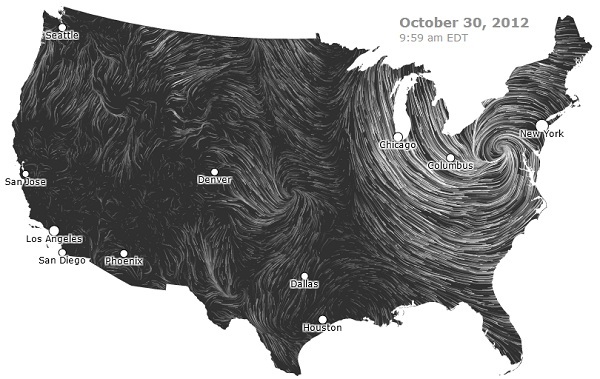 To see the current wind patterns, visit the Wind Map's Web page. Here's holding thumbs for all of those still caught up in this mess. You've got an interesting few days ahead of you. EDITED TO ADD: The Los Angeles Times has a great collection of photographs of the damage caused by Hurricane Sandy. Worthwhile viewing. Last night I had a sore throat, and by this morning it had developed into a full-blown case of the crud. I'm really not feeling at my best tonight, so blogging will be light. Look for more posts tomorrow morning. To keep you happy in the meantime, here's the latest Simon's Cat video. The old fridge we've used since moving here is on the verge of final collapse. It's leaking water into the fridge compartment from the freezer and ice-maker, and even cutting off the water supply to the latter hasn't cured the problem. This morning, when I opened the door, my sleepy tootsies were baptized in ice-cold water, which caused me to remember a few relatively expressive words I thought I'd forgotten. I called a serviceman, but he recommended that I not call him out, because it'd cost me $150 up front, without parts, and given my description of the problem, he thought I'd be wasting my money. He pointed out that it's cheaper to replace most fridges today, rather than pay for a major repair. The last time I bought a fridge was about a decade ago, in another state, so I wasn't prepared for the sticker shock of going online and pricing what was available. Their prices have at least doubled since last time - no doubt due to the fact that they're all imported, because thanks to the Fed's printing of money like there's no tomorrow, the dollar has lost a significant amount of value against foreign currencies over the past few years. I rapidly decided that there was no way Miss D. and I could afford something new. Fortunately, our housemate told us about a 'seconds' store nearby that sells goods damaged in transit, or repaired after a malfunction under warranty that caused the original to be replaced with another unit. Their prices are significantly discounted from list, and I was able to find a very nice Whirlpool unit, with only minor cosmetic blemishes, that was affordable. It'll be delivered on Wednesday. I have to say, though . . . looking at the prices of appliances today, I honestly don't know how couples starting out in life together can afford them - at least, not new. When I furnished my small home in 2003, I spent about $1,500 to buy a decent-size fridge, a washer, a drier, and a chest freezer. Today, that sum would buy me only a new fridge, and it wouldn't be as nice as the one I bought in 2003! 'The toughest bridge in the world'? That's the title of this video clip. A tip o' the hat to reader S. M. for sending me the link. I note that despite all those crashes, the bridge is still there. It's tough all right! Could this be described as a 'grave' error? IT'S the loo that is taking the term toilet humour to a whole new level - and it has Millaa Millaa residents in a spin. 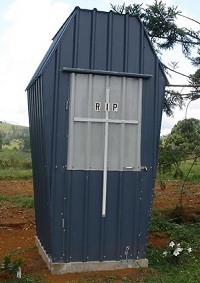 After being told by council it would cost more than $80,000 to build a toilet at the local cemetery, the Chamber of Commerce group decided to take issues into their own hands and build their own - in the shape of a coffin. "You have to be careful, not everyone is going to have our macabre sense of humour," Chamber president Pat Reynolds said. "But we did it with good intentions. It's for firstly, the cemetery, and secondly, maybe a few more people will notice Millaa Millaa now." This is no shabby construction, it has a cement foundation, a septic system and solid walls, one of which bears a cross and the letters RIP. There's more at the link, including more (and larger) photographs of the offending outhouse. Sounds to me like a practical application of the well-known Australian (and colonial) practice of 'taking the p***' - in this case, quite literally! I hadn't realized how deeply the rot had set into the British education system until I read this report in the Telegraph. Williams F1 is “frustrated” over the state of education in Britain today after the majority of school leavers applying for its apprenticeship scheme this year failed a basic maths test. Of the 250 applications for its apprenticeship scheme this year, 45 were invited to an open day and 16 made it through to the tests round. Just six young people passed, with 10 failing to get more than half the answers right – a failure rate of two-thirds. In previous years, the company allowed hundreds of applicants to sit maths tests early on in the recruitment rounds, but this led to such a high failure rate the company abandoned the tests until later in the hiring process. There's more at the link, including the test questions (below the article). If you'd like to try them, you'll find the answers here. I tried several and had no problem getting them right, the majority of them using mental arithmetic alone! If British students today can't handle such simple math problems, something's drastically wrong with their education system. Never having attended school in the USA, I can't say how US students would fare when faced with the same questions. Would any readers care to hazard a guess from their own experience? The Silicon Graybeard links to something I'd not heard of before, but found highly amusing: a condensed script to the movie 'The Perfect Storm'. Here's an excerpt. Diane Lane: Thank goodness you're back from that non-descript period of time on the sea. I missed you so (She smooches Mark Wahlberg). Karen Allen: While I, personally, no longer care what fate befalls you, our son here might be happy you have returned. John C. Reilly: Hey, big guy! How are you compensating for the constant absence of a strong father-figure? Mary Elizabeth Mastrantonio: I'm glad you're back from your voyage. Maybe it would have been possible for you and I to have had some sort of romantic relationship if you weren't so extremely gruff. George Clooney: I'm quite gruff, all right. John Hawkes: It's too bad I have no romantic involvement to greet me after my lonely days upon the sea. Times like this remind me of just how blindingly unattractive I am. There's more at the link. Good for a giggle! Carteach asks: "Are your 'home defense' weapons really there for you?" Sage advice from one who knows. He also recommends a gas-canister-fueled stove for emergency use. User reviews on Amazon appear to support his high opinion of it. I've already ordered mine. Murphy's Law discovers that his dog regards his pain as an invitation to fun and games. Hilarity ensues . . .
Old NFO brings us a story from the hottest days of the Cold War, when the world stood on the brink of a nuclear holocaust. It's a sobering reminder of how very, very close we came to global disaster. On a lighter note, he gives us this illustration of an . . . er . . . unusual road hazard. 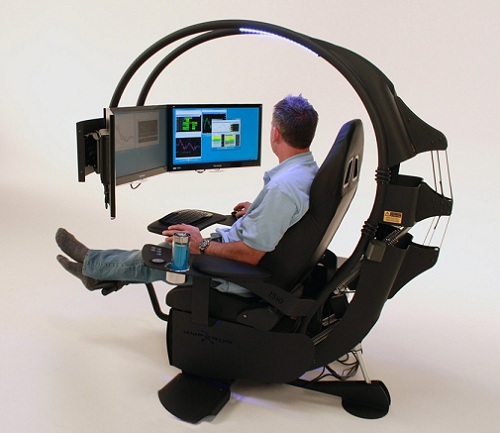 Some time back, Mulligan at Do Over posted a picture of this weird-looking computer workstation. It's apparently called the Emperor 1510 by its manufacturer. Certainly looks imperial to me - like something from the Death Star! Borepatch departs from his usual food for thought to bring us food for the body - to be specific, bison teriyaki. I'd not have thought of combining bison and Oriental flavoring, but he says it works well. I can see I'll have to duplicate his experiment . . . all in the interests of science, of course! Dr. Grumpy points out that part of the course for the US Marine Corps Marathon, held in Washington DC today, had an . . . er . . . interesting shape. I'd say he has a point . . . and knowing the Marines, I'm not so sure it was accidental! Warren Meyer points out that the Solyndra scandal is far from over. Now the backers of the idea, having walked away with over half a billion dollars in US taxpayer money, want to mine the dregs of what remains of the company for hundreds of millions of dollars in tax write-offs. Is it any wonder we're sick of crony capitalism? In similar vein, Midwest Chick responds to a snooty liberal perspective on the current election with a very down-to-earth smackdown. She refers to it in terms of 'Republican' and 'Democrat', but I think it's not so much party-political as statist versus libertarian in orientation. Worth reading. Finally, MSgt B. brings us a rejection letter from Playgirl (scroll down at the link to see it). 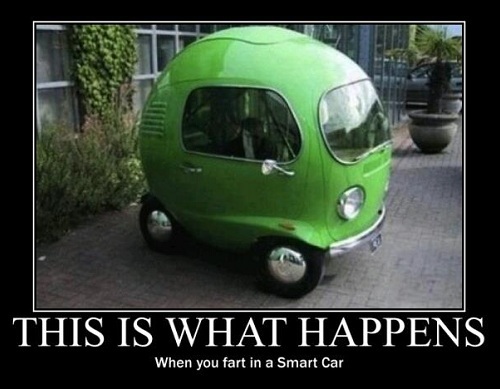 It made me snort coffee all over my keyboard! That's it from the blogosphere for this week. A bicycle as a mobile art form? 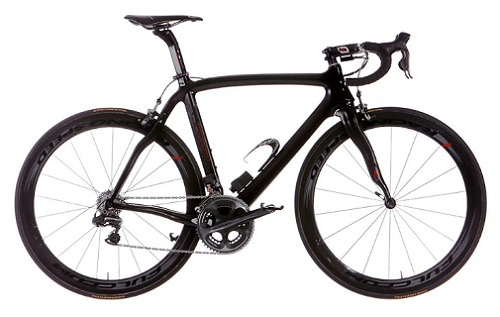 The Pinarello Dogma 2 carbon-fiber racing bicycle (shown below) was used by the winner of this year's Tour de France race. It's the current pinnacle of racing bike technology. Now famed British cyclist Martyn Ashton has put this $16,000 racing machine through its paces in an exhibition of artistry and control that's breathtaking. I suggest watching it in full-screen mode. What can one say except, "Wow!"? Bee Wilson, a food columnist for the Telegraph in the UK, has written a book called 'Consider The Fork: a history of how we cook and eat'. Writing about it in her column, she provided a tidbit of information of which I hadn't been previously aware. The most startling thing I discovered while writing the book was the way that our bodies may have been changed by cutlery. The alignment of our jaws and teeth is probably a product of how we cut up our food during our youth. The normal arrangement of human teeth, as any orthodontist will say, is an overbite: our top layer of incisors hang over the bottom layer. What the orthodontist doesn’t tell you is that our jaws have only been like this for about 250 years. Before that surviving skeletons display an edge-to-edge bite, like apes. In the 1960s C. Loring Brace, an American anthropologist, became obsessed by the overbite and why it had emerged so recently. The only way he could account for it was the adoption of the knife and fork. Before the fork we would have clamped chewy food between our incisors, wearing teeth down. Once we started cutting our food into morsels – from childhood onwards – our incisors kept growing (dentists would say 'erupting’) into an overbite. The clincher, for Brace, was the discovery that this change in teeth happened around 900 years earlier in China than in Europe. The reason? Chopsticks! So yes, cutlery does matter. It’s just not all about manners. How fascinating to think that the invention of a particular eating utensil actually changed the shape of our jaws and faces! Does this mean that if future generations discard the fork and chopsticks, they'll lose their overbite as well? I've always had a visceral, outraged reaction to the idiots who think up and spread conspiracy theories. They're usually based on little or no evidence (sometimes claiming as 'evidence' facts that have nothing whatsoever to do with their theory), cause much mischief among those who lend any credence to them (despite the fact that they should know better), and sometimes do a great deal of harm to the families and survivors of those affected by the rumors. Two classic examples are circulating right now in connection with the attack on the US consulate in Benghazi, Libya, last month, and the death of the US Ambassador and three others. The first claims that because the US Navy is temporarily replacing the Rear-Admiral formerly in command of the USS John C. Stennis strike group, this is somehow related to the Benghazi incident. It's completely untrue, because (as the Stars & Stripes article announcing the replacement points out) the Stennis sailed from Washington state in August and crossed the Pacific to its operational area in the Middle East (near the Persian Gulf). It was nowhere near the Mediterranean Sea during the Libyan crisis, and was therefore not in a position to intervene. The relief of the Rear-Admiral commanding the strike group clearly has nothing whatsoever to do with events in Libya. The story continues that now General Rodiguez (sic) would take General Ham's place as the head of Africon (sic). There's more at the link (although why you'd want to read such scurrilous nonsense, I don't know). I'm sure all the officers involved have been embarrassed by these unfounded rumors. I agree that the entire Libyan affair was a scandal - I've written about it before - but to spread unfounded rumors like those above, about such a tragedy, is completely unacceptable. Irresponsible speculation and attempts to make political capital out of the tragedy are just as bad. We're talking about people's lives here, dammit! As one who's had to counsel the survivors of the victims of murder and other untimely deaths, I can't help but think of how much distress such rumors must inevitably have caused to the families of those who died in Benghazi. I'll have no ethical or moral qualms if something creatively painful happens to those who instigate and spread them. Such rumor-mongering is (to my mind) as much an atrocity, in its own way, as the murder of US citizens. Tractor pulling - on steroids! All tractors, in their respective classes, pull a set weight in the sledge. When a tractor gets to the end of the 100 metre (300 feet) track this is known as a "full pull". When more than one tractor completes the course, more weight is added to the sledge, and those competitors that went past 300 feet will have a pull-off; the winner is the one who can pull the sledge the farthest. The sledge is known as a weight transfer sled. This means that as it is pulled down the track, the weight is transferred (linked with gears to the sledge’s wheels) from over the rear axles and towards the front of the sledge. In front of the rear wheels, there is a "pan". This is essentially a metal plate and as the weight moves over this the resistance builds. The further the tractor pulls the sledge, the harder it gets. Some of the 'tractors' are so heavily modified and souped-up that they resemble nothing less than science-fiction spacecraft! Here's one from a Dutch tractor pull last year. It seems a Leopard 2 tank of the Dutch Army tried its hand at a tractor pull in the Netherlands a couple of years ago. A modern main battle tank, with its tracks, heavy armor and (in this case) a 1,500hp turbocharged diesel engine, is a whole different breed of animal when it comes to tractor pulling, as the video clip below illustrates. OK, that's pulling power! Good thing there was an earth berm at the end of the track to stop them, or they might still be under way! Solitary confinement: is it necessary, or is it torture? Journalist Shane Bauer, who spent two years in detention in Iran, has produced a series of articles for Mother Jones about prison and solitary confinement. He's fiercely critical about it. Here's his video introduction to the articles. His articles argue persuasively that the assignment of many inmates to solitary confinement is irrational, unrelated to their actions or conduct, and frequently based upon questionable evidence. Unfortunately, he makes the assumption that what prison inmates tell him is trustworthy: and therein lies the Achilles heel of his articles. I won't dispute Mr. Bauer's claim that in the California prison system, there may be 'broken' administrative processes that cause inmates to be put into solitary confinement for the wrong (or no) reasons, or prevent their cases from being re-examined. I've never worked in that state's prison system, so I have no first-hand experience from which to support or oppose his position. On the other hand, in the Federal and state prisons to which I have been exposed, I've seen very little evidence of capricious, wilful incarceration of inmates in solitary confinement. In every case I saw, or of which I was aware, there were either good reasons for it, confirmed by subsequent investigation, or it was reversed in fairly short order when those investigations didn't turn up corroborating evidence. As for whether solitary confinement is 'cruel and unusual punishment', what alternative is there? Those placed in solitary have already been convicted of criminal offenses - some of them multiple times - and sentenced to long terms behind bars. Many will have 'regressed' from easier, more lenient facilities to higher-security units on the basis of their behavior. (Only the really bad boys are assigned to maximum- or high-security prisons, because it costs a lot more per inmate to keep them there.) If, even there, they break prison regulations and pose a threat to good order and discipline, what measures are left to the staff? Find me a workable alternative to solitary confinement, one that will do at least as much to contribute to good order and discipline in the prison, and I'll support it - but I can't think of one, and I don't think you can either (apart from execution, of course, and that's not going to happen). I recommend reading Mr. Bauer's articles. They offer a sobering and painful perspective on the reality of solitary confinement in at least one US prison system. I'll even agree with him that the practice may be cruel, even vindictive at times. However, that doesn't mean that it's not necessary. It's a bit like surgery. No-one in his right mind wants to be cut open and have bits and pieces removed . . . but when the alternative is death, he 'bites the bullet' and accepts the pain and suffering as being unavoidable and necessary. In the same way, solitary confinement is extremely unpleasant, but I see no alternative to it. Unless and until one can be found that's at least as successful in reducing prison violence and enforcing compliance with regulations, I fear solitary confinement must and will inevitably continue. That point appears to be lost on Mr. Bauer . . . I've been writing about our (and the world's) parlous economic situation for a long time. I've also warned of ongoing social deterioration and disruption. Now comes a very insightful newsletter that links these phenomena in a very clear, understandable way. John Mauldin, in his latest weekly 'Outside The Box' newsletter (link is to an Adobe Acrobat document in .PDF format), provides an assessment by Société Générale analyst Dylan Grice. I'm going to reproduce a few excerpts here (from the 16-page newsletter). I am more worried than I have ever been about the clouds gathering today ... I hope they pass without breaking, but I fear the defining feature of coming decades will be a Great Disorder of the sort which has defined past epochs and scarred whole generations. I keep wondering to myself, do our money-printing central banks and their cheerleaders understand the full consequences of the monetary debasement they continue to engineer? Inflation of the CPI might be a consequence both seen and measurable. A broad inflation of asset prices might be a consequence seen, though not measurable. But what about the consequences that are unseen but unmeasurable – and are all the more destructive for it? I feel queasy about the enthusiasm with which our wise economists play games with something about which we have such a poor understanding. History is replete with Great Disorders in which currency debasement has coincided with social infighting and scapegoating. Central banks provided cheap money to banks, the cheap money artificially inflated asset prices, artificially inflated asset prices made anyone connected to those assets rich as we became a nation of speculators, those riches were achieved at everyone else’s expense, and ‘everyone else’ has now realized what has happened and is understandably enraged ... as Keynes explained, “Those to whom the system brings windfalls ... are the object of the hatred." I’d feel a whole lot better if central banks stopped playing games with money. But I can’t see that happening anytime soon. The ECB has thrown the towel in, following the SNB last year in committing effectively to print unlimited amounts of money for the greater good. The BoE and the Fed have long since made a virtue of what was once considered a necessity, with what was once the unconventional conventional. All I see is more of the same - more money debasement, more unintended consequences and more social disorder. There's much more at the link. Important, even essential reading for anyone concerned about our economic prospects and the decay of our society. Kudos to Mr. Mauldin for bringing Mr. Grice's very trenchant analysis to a wider audience. If you haven't already subscribed to his free newsletters, may I suggest you click the link to do so? I find them invaluable. All right, who did it? Talk about the hang-dog look! I'm glad I wasn't on this flight! Shipping a standard 20-foot ISO container from Afghanistan to Britain will cost between US $8,000 and $19,000, while moving it by air over the same distance could cost anywhere between US $16,000 and $50,000. Costs to ship a similar container all the way back to the USA would be at least similar, perhaps higher. According to Aviation Week, "The total U.S. military presence in Afghanistan has a footprint of some 20,000 containers of equipment, and 30,000-40,000 vehicles of all types". Air Force transporters won't be able to handle so huge an airlift on their own. Key civilian aircraft such as the Antonov An-124 (already chartered by the USA to move equipment to and from Afghanistan) are in short supply. There are only about two dozen of them available for hire, and NATO nations will be competing with each other to charter them - along with Formula One teams, Chinese exporters and others who rely on their services. If we work on an average transport cost of $25,000 per container (which is probably conservative), plus a similar cost per military vehicle, it seems the USA alone is looking at a cost of well over a billion dollars just to get our equipment out of Afghanistan - and that doesn't include the expenses that will be incurred by our allies. You lost your cellphone WHERE??? 1. A farmer in Devon claimed his phone had disappeared inside the back end of one of his cows when he’d been using the torch [flashlight] on his iPhone whilst assisting the cow during calving. The phone later made an appearance, but was damaged. 4. A woman in her late 20s from Bristol claimed the vibration function on her BlackBerry Bold 9900 phone had stopped working whilst she was using it as an adult toy. 8. A pyrotechnician was setting up a show for the National Fireworks Championships in Plymouth, and having left his iPhone 3GS within the "blast zone", it was nowhere to be found when he returned post-show, having been fired 3,000 feet into the air before exploding in a stunning display. In the first place God made idiots. The retired space shuttle Endeavour was recently moved by road from Los Angeles International Airport to its permanent display site at the California Science Center in Exposition Park. The video clip below is a time-lapse record of its final journey. I recommend watching it in full-screen mode. The Los Angeles Times, which produced the video clip, has a very interesting article about how it was made. It looks to have been a very complex and arduous task. Recommended reading. The primary technical goal of the DRC is to develop ground robots capable of executing complex tasks in dangerous, degraded, human-engineered environments. Competitors in the DRC are expected to focus on robots that can use standard tools and equipment commonly available in human environments, ranging from hand tools to vehicles, with an emphasis on adaptability to tools with diverse specifications. To achieve its goal, the DRC aims to advance the current state of the art in the enabling technologies of supervised autonomy in perception and decision-making, mounted and dismounted mobility, dexterity, strength, and platform endurance. Aftershocks from the earthquake still shaking the broken ground, the robot grabs a monkey wrench from a wounded plumber, jumps into his Ford F150 truck, and drives over the smoking rubble to the collapsing building, where poisonous gas from a fractured pipe is preventing rescuers reaching survivors. Pushing through the scalding cloud and knocking down a teetering wall, the robot reaches the leaking pipe and locates the valve, shutting off the gas. That's one scenario behind DARPA's ... DRC, which aims to demonstrate a robot that can help humans respond to disasters by going where they can't. Live challenges are planned for December 2013 and December 2014. Teams will have to demonstrate robots that, with supervised autonomy in a disaster scenario, can use tools and equipment available in human environments, ranging from hand tools to vehicles. The concept of a 'rescue robot' isn't new, but its practical implementation has always lagged behind the available technology. DRC intends to change that. To illustrate the current 'state of the art', here's a video clip of the so-called 'Pet-Proto' robot making its way through a simulated structure. I'll be watching this competition with interest. I've had a few inquiries from readers of earlier articles in this series, commenting that they're on a very limited budget indeed (some have lost their jobs), and don't have spare disposable income to begin building up their emergency supplies. They ask what can be done by people in their situation. In this article, I'm going to address a 'bare-bones' approach to putting together your emergency stash. It won't involve very tasty or varied foods, or high-quality items, because such things are likely to be too expensive on a very limited budget. Nevertheless, if you can't spend more than an absolute minimum, these suggestions will equip you to survive at a very basic level for a few weeks. I suggest you prioritize your purchases. If you have no emergency supplies of food at all, start there. Once you've put together enough for a couple of weeks, look at other needs. Don't be tempted to say, "Well, he recommends that cheap item, but if I spend only $10 more I can get this better one." If your finances are really that tight, you can't afford to put an extra $10 into one area of preparation, because you'll be robbing another area by doing so. Get the basics first, then start expanding or upgrading in each area as money allows. Pasta - basic varieties such as macaroni or penne. Pasta sauce and/or salsa. If necessary, a single jar can be 'stretched' to season or flavor a week's supply of pasta, plus whatever you add to it (although two to three jars will be better). Beans (dried) - red (kidney), brown (pinto), black (turtle) and white (navy) beans are all useful. Oatmeal - it's cheapest in the large bulk packs, and you can separate it into smaller Ziplock bags for ease of storage. You can eat it as oatmeal/porridge, or add it to other foods such as stews to thicken them. Instant oatmeal sachets are more expensive by weight, but also quicker and more convenient to prepare, and come in several flavors to add variety to your meals. Canned tuna. It's just about solid protein, and relatively low-cost - 5oz. cans are currently 69c at my local supermarket (albeit with about 1oz. of that being water!). The foil pouches of tuna are very nice indeed, and aren't 'bulked out' with water, but they're much more expensive per ounce than cans. On a tight budget, cans are the way to go. Canned meat. Spam may be boring and bland, but it's cheap and nutritious, and can be added (cubed) to rice and beans, or to pasta. It's also relatively inexpensive. Alternatives to Spam include corned beef, canned beef stew, canned chicken, etc. Get whatever your tastebuds prefer and your budget will allow. Instant coffee. Drip-brewed or percolated coffee tastes better, but it takes longer to prepare, costs more, and requires additional hardware. Instant coffee may not taste as good, but it's quick and easy to prepare. For an emergency, it's the sensible choice. Condiments. With such a basic, unvarying diet, it helps to be able to add a little flavor. Salt, pepper, ketchup, Worcestershire sauce, hot sauce, etc. are all useful. You may want to stock sugar/sweetener and coffee creamer as well. Stock a little extra of what you normally use, and when you need more, take it from your reserve supplies and replace it with fresh. Multi-vitamin tablets. On a restricted diet such as we're discussing here, these are vital. Get the sort that promise you a balanced daily intake of all essential vitamins and minerals, and take one morning and evening to make up for nutritional shortcomings in your menus. DON'T FORGET TO BUY A SPARE CAN-OPENER!!! Store it with your emergency supplies. This selection, stocked in adequate quantities, will give you enough nutrition to keep you alive for a few weeks. Based on eating 2,000-2,500 calories per day, I'd plan on the following quantities per person for one week (multiply by the number of people - and the number of weeks - for which you wish to provide, to get your own total). A few cans of Spam or alternative meats (smaller cans mean that you don't have to refrigerate leftovers, but larger cans are more convenient for multiple people). You'll probably get very tired of those ingredients after a few days, but hey - this is an emergency, after all! Be grateful that you've got something to eat, and worry about variety when things get back to normal. The total cost of a one-week supply, for one person, of all those ingredients is currently less than $30 at the supermarket where I shop (Aldi). A final note: infants and young children will probably want more variety in their food than adults, and they won't necessarily understand that in an emergency, that variety may not be available. It's probably worth providing some candy and other kid-friendly food for them, and powdered drink mix to add to their water. If you have pets, remember to stock up on food for them as well! I've already written an entire article about this. Briefly, start collecting used 2-liter soda bottles (with their caps, of course). If you don't use them, ask your friends and neighbors to keep theirs for you - that way, you get them free of charge, which is always good! Wash them thoroughly, then store them somewhere out of the way (I keep a couple of 30-gallon garbage bags filled with them in the basement). Two of these bottles hold just over one US gallon. A minimum water ration is one gallon (= 2 full bottles) per person per day, so use that baseline to calculate how many bottles you need to collect. Also, buy a bottle of unscented bleach, and use it to purify your stored water if necessary. By accumulating used soda bottles, you can store water almost free of charge - you pay only a few cents to fill them at the tap. You can add some commercially bottled water if finances allow. In an extended emergency, you probably won't have access to electricity or mains gas (although if you use a tank of gas outside your home, that should remain usable until it runs out). You're going to need another means to cook your food. If you're on a tight budget, I don't think camp stove fuel or gas cylinders are likely to be affordable; so you need to look at simple, easy-to-use wood-fired cooking methods. A campfire is all very well, but it wastes a lot of heat that escapes around the sides. A small charcoal BBQ unit is OK for grilling, but not to cook with pots and pans. For emergency use, I recommend a small rocket stove, which you can buy or make yourself (this article shows a particularly easy and low-cost way to make one). If you aren't good with your hands, ask a friend to make one for you. It's by far the simplest, easiest and cheapest solution I've found. These stoves use small pieces of wood - off-cuts from your workshop, twigs, small branches broken into short lengths, etc. Start gathering such fuel now, and store it in a box in your garage or basement (or, if you wish, build a woodpile in your garden). Make sure you keep it dry, so that when you need it, it'll burn easily. Make some fire-starters as well, and keep them handy - matches, too! Cook on your balcony or in the garden - not indoors! The fire hazard, and the risk of carbon monoxide poisoning, are too great. Be sure to put a fire-proof, heat-proof surface underneath your stove. Use disposable plates, cups and utensils rather than crockery and cutlery, to avoid wasting water by washing them. A 30-day supply of the disposable versions won't be very expensive. You'll need enough light to cook in the evenings, and locate supplies, and perhaps read a book. A few LED flashlights will go a long way towards meeting this need. They needn't be expensive: I bought six of this 12-lumen unit (including batteries) at Wal-Mart a few days ago for $1.50 apiece, and two of these 18-lumen units for $1.88 apiece (again, including batteries). At those prices, you can afford to keep several of them on hand: one for each person in your household, one for each room, and one in each vehicle. They also make great barter items - for example, in an emergency, your neighbor may desperately need a flashlight, while you need a gallon of gas for your car, or some of his food. Remember to store extra batteries - these can be accumulated over time. When you need fresh batteries, take the oldest ones from your emergency supplies and replace them with new ones. Many other needs have not been addressed here. You'll require some means to defend yourself, your loved ones and your supplies against those who have nothing and want to take what you have. You'll need something to amuse yourselves while you wait for things to return to normal - books, games, puzzles, etc. Remember to provide soap, shampoo, toothpaste, clothes-washing detergent, toilet paper, sanitary napkins, etc. as required. All these things are extras, and you'll have to provide for them as best you can. Also, stock a few items that are really useful, but which people often neglect to purchase for themselves, or lose, so that you can swap them for things you need. Can-openers are a good example; also flashlights (see above) and pocket-knives. (This Ozark Trail pocket-knife currently sells for only one dollar at our local Wal-Mart, which is almost unbelievably cheap! It may not be the best quality, but it's better than nothing: and as trade goods during an emergency, it'll be worth a lot more than you paid for it.) Toiletries and sanitary consumables will also be in demand. What I've tried to do here is demonstrate that even if money is very tight, you can still make adequate preparations for bare-bones survival in the event of a shorter-term emergency. I daresay that a couple could stock up on enough of the essentials I've listed here to last them for a month, for a total expenditure (at current prices) of about $300. If you budget $5 per week, or $25 per month, to build up your reserves, you can be there in a year. Once you've got the basics, you can add more variety to your food stocks, or buy other items you may need. Did Ambassador Stevens die in another 'Iran-Contra scandal'? An article in the Washington Times suggests that clandestine, US-supported and -approved arms smuggling between Libyan and Syrian militants may have been behind the attack on the US consulate and the murder of Ambassador Stevens in Benghazi last month. Here's an excerpt. The evidence suggests that the Obama administration has not simply been engaging, legitimating, enriching and emboldening Islamists who have taken over or are ascendant in much of the Middle East ... the Obama administration has been arming them, including jihadists like Abdelhakim Belhadj, leader of the al Qaeda franchise known as the Libyan Islamic Fighting Group. It now appears that Stevens was [in Benghazi] — on a particularly risky day, with no security to speak of and despite now copiously documented concerns about his own safety and that of his subordinates — for another priority mission: sending arms recovered from the former regime’s stocks to the “opposition” in Syria. As in Libya, the insurgents are known to include al Qaeda and other Shariah-supremacist groups, including none other than Abdelhakim Belhadj. What cries out for further investigation — and debate in the remaining days of this presidential election — is whether this shipment was part of a larger covert Obama effort to transfer weapons to our enemies that could make the Iran-Contra scandal, to say nothing of Operation Fast and Furious, pale by comparison. It gets worse. Last week, Center for Security Policy senior fellow and former career CIA officer Clare Lopez observed that there were two large warehouse-type buildings associated with the so-called “consulate” whose purpose has yet to be disclosed. As their contents were raided in the course of the attack, we may never know for sure whether they housed — and were known by the local jihadis to house — arms, perhaps administered by the two former Navy SEALs killed along with Stevens. Gen Nikolai Makarov was quoted by the Interfax news service as saying the origin of the surface-to-air missiles should be "cleared up". "We have reliable information that Syrian militants have foreign portable anti-aircraft missile systems, including those made in the USA... it should be cleared up who delivered them," Gen Makarov told journalists in Russia. Again, more at the link. (SA-7's were among the weapons 'liberated' by Libyan militants during the overthrow of Colonel Gaddafi.) The US Defense Secretary has just denied any knowledge of Stinger missiles being supplied to Syrian militants - but if the program was clandestine, he might not have been aware of it. If these claims are true, it's no wonder the Administration has been desperately trying to point fingers in every possible direction except the correct one. This would mean that Ambassador Stevens died in the equivalent of another Iran-Contra scandal. Imagine what that might do to President Obama's chances of re-election in November . . . I hope the truth comes out, and that (if the allegations in the Washington Times article prove to be true) the guilty parties are punished to the fullest possible extent of the law. The four Americans who died in Benghazi - perhaps as tools of a dishonest and perverse US policy? - deserve at least that. Perhaps both of these drivers should get "Doofus Of The Day" awards . . .
On the other hand, perhaps both of them should simply grow up! Long-time readers may remember that back in November last year, we looked at Boeing's Counter-electronics High-power Microwave Advanced Missile Project (CHAMP). Boeing's just announced the first operational test flight of the new guided weapon. On Oct. 16th at 10:32 a.m. MST a Boeing Phantom Works team along with members from the U.S. Air Force Research Laboratory (AFRL) Directed Energy Directorate team, and Raytheon Ktech, suppliers of the High Power Microwave source, huddled in a conference room at Hill Air Force Base and watched the history making test unfold on a television monitor. CHAMP approached its first target and fired a burst of High Power Microwaves at a two story building built on the test range. Inside rows of personal computers and electrical systems were turned on to gauge the effects of the powerful radio waves. Seconds later the PC monitors went dark and cheers erupted in the conference room. CHAMP had successfully knocked out the computer and electrical systems in the target building. Even the television cameras set up to record the test were knocked off line without collateral damage. In all, seven targets were hit using CHAMP’s high power microwaves in the one-hour test that degraded and defeated the electronics inside the test buildings. Coleman, who led the Boeing team in the historic test flight, says the team is currently analyzing data and telemetry from the test that many consider a big step in modern non-lethal warfare. “Today we turned science fiction into science fact,” Coleman said. There's more at the link. Here's a video report about the test. It's a remarkable advance in weapons technology, all right . . . but it also adds a worrying new capability to Big Brother's arsenal for internal use. After all, there'd be an outcry if drones carried out lethal strikes against US citizens on US soil. This new type of weapon makes it possible to cut all power, communications, etc. to an apartment block - perhaps even an entire city block - and move in on selected targets or individuals while the lights are out, with little or no warning possible. Those who aren't targets will be inconvenienced regardless - and if they happen to need electrical power for health care equipment such as ventilators, etc., they may become 'collateral damage' whether they like it or not. The more impersonal and technological warfare becomes, the less human it becomes - and therefore the easier it becomes to indulge in it. It's like the USA's "drone wars": a target is designated, and a drone launches a missile. No court of law has any say in whether or not the target is deserving of death or other punishment. After the fact, it's emerged that hundreds of civilians and non-combatants have been killed in this way - although the current Administration has sought to re-define the meaning of the term 'civilian' to deflect criticism. In the long run, I doubt whether "remote warfare by technology" will be good for the human race . . . but then, 'normal' warfare hasn't been much good either, has it? Scientists warned that researchers in areas involving unpredictable natural threats, like volcanology and even meteorology, will now be more reluctant to offer advice and insight to the public. "If it stands, this verdict will have a chilling effect on earthquake science in Italy and throughout Europe," said Sandy Steacy, professor of earthquake physics at the University of Ulster. "Who would now be willing to serve on an earthquake hazard evaluation panel when getting it wrong could mean a conviction for manslaughter?" "Imagine if the government brought criminal charges against your local meteorologist for not being able to predict the exact path of a tornado," said Halpern. "Scientists need to be able to share what they know - and admit what they do not know — without the fear of being held criminally responsible should their predictions not hold up". It seems to me this is yet another manifestation of the 'nanny state'. I suspect the court felt that, since the scientists concerned were publicly funded to research warning signs of earthquakes, they'd been paid to give warnings, but had failed to do so. Their failure was thus (I presume) not a lack of due scientific diligence, but a failure to provide a return on the nanny state's investment. Whatever the court's reasoning, I suggest it's just ensured that no further scientific warnings or reassurances will be given in Italy concerning any natural phenomena whatsoever . 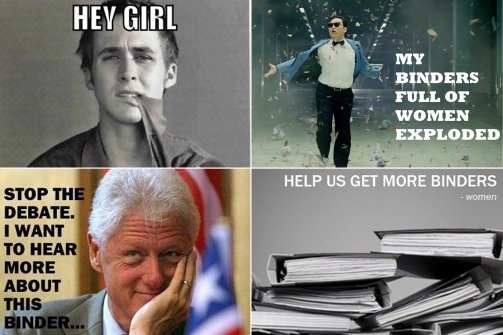 . .
About those binders full of women . . . Readers may remember Mitt Romney's comment last week that as Governor of Massachusetts, he asked his staff to find women qualified for vacant positions. I particularly enjoyed the reaction of shoppers on Amazon.com. They flooded an entry for 'Avery Durable View' binders with well over a thousand reviews, all on the theme of binders filled with women. Here are a few examples. I was originally going to rate this only 1 star. You see, I'm a big girl and I can only squeeze about 53% of myself into this binder. But then I decided that I'm not going to worry about the other 47%. richer, 'cause, well, 'cause we could. With apologies to Joyce Kilmer. Again, there are many more at the link. Someone had too much time on his hands! Could this be a solution to our debt crisis? About that increasing crime rate . . .
Rotors cancel each other out! Ever heard of a 'Freebord'? Who knew color choice could be so complicated? Who says fat is all bad? An actual fork in the road! Passwords, computers, and . . . pacemakers? When a potter needs a wheel . . . Forget herding cats - how about ducks? Detroit - a lesson in "entitlement government"
Car company of the decade? I find this cynically delightful! Have smartphones destroyed the movies? Bengal cats sure are talkative! Creepy - and slimy too!